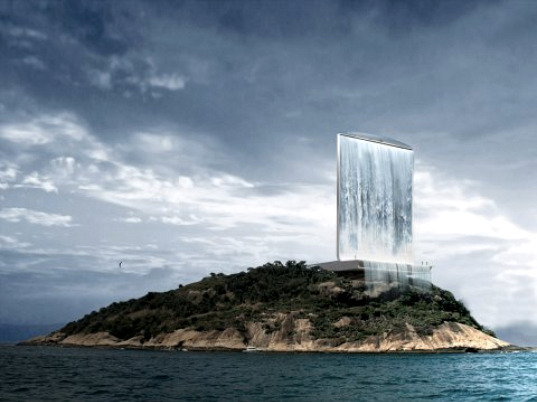 This renewable energy generating tower located on the coast of Rio is one of the first buildings we’ve seen designed for the 2016 Rio Olympics, and boy, is it crazy! (In case you didn't notice, it's also a waterfall.) The Solar City Tower is designed by Zurich-based RAFAA Architecture & Design, and features a large solar system to generate power during the day and a pumped water storage system to generate power at night. RAFAA's goal is that a symbolic tower such as this can serve as a starting point for a global green movement and help make the 2016 Olympic Games more sustainable. 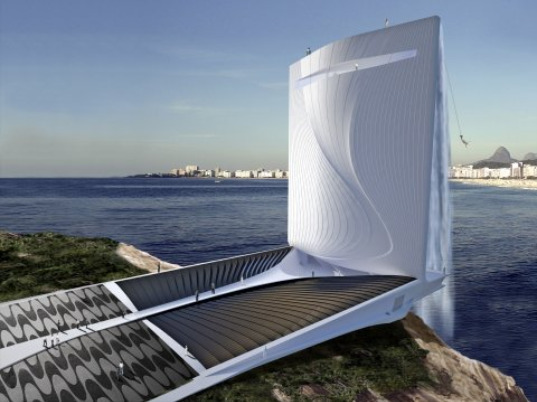 The self-sustaining tower for the 2016 Olympic Games is designed to create renewable energy for use in the Olympic Village as well as the city of Rio. A large solar power plant generates energy during the day. Any excess power not used during the day is utilized to pump seawater into a storage tank within the tower. At night, the water is released to power turbines, which will provide nighttime power for the city. On special occasions water is pumped out to create a waterfall over the edges of the building, which RAFAA says will be, “a symbol for the forces of nature.” Info on the size of the solar and pumped water storage system is not available yet. Access to the eco tower is gained through an urban plaza and amphitheater 60 meters above sea level, which can be used for social gatherings. On the ocean side of the 105 meter tower (behind the waterfall) is a cafeteria and shop. An elevator takes visitors up to the top floor where an observation deck offers 360 views of the ocean and city. At level 90.5, a bungee platform is available for adventurous visitors. After reading the comments here I have come to the conclusion that people in general are just cynical. Here is a beautiful building that is using solar energy for most if not all of the power needs of not only the building but, if I am correct, the Olympic Village. They could have just set up an array of solar panels in a fancy design and called it good but they didn't. They decided to create a building that could be useful and beautiful as well as innovative. And people, true to form, criticize the unknown fearful of something new and unusual. I am sure that Henry Ford got similar criticism from people of his time but thankfully he didn't buckle under and there were enough people that supported him back then. As back then we now need to support the innovators of today and encourage them to continue to keep trying even if one or two of their ideas don't pan out. The only true failure is when you never try at all. I think some folks forgot their basic physics (or never took the class) and the concept of potential energy. Solar is great, abundant, clean, etc., but it is often associated with battery packs to store the energy. Pumping water to great heights, when excess or relatively "cheap" power is available, is a form of "battery storage" of all that potential energy. And, guess what? It doesn't require the caustic ingredients of traditional battery. By the way, the waterfall is just for show, and use during special occasions. No one is crying "what a waste!" when water is released through a dam. Since this is ocean water , the salt spray would kill any plant on that island. Every piece of the structure itself would be subject to concrete cancer and corrosion. Any glass would be simple unusable. The maintenance costs of such a structure would be unsustainable. I would recommend to get some engineers involved in the brain storming. Pumped storage projects BY THEMSELVES are definitely net energy users. However, the rationale for building them is that water is pumped to the upper reservoir when energy demand is low and therefore the electricity is "cheap" in relative terms, and then the water is released down through the penstocks to operate the pumps-turned-turbines to generate electricity during peak energy demand times when the electricity is relatively "expensive." So in those applications it is a purely commercial calculus that determines the viability. In this proposal, there is the added element of the renewable solar energy being generated, used to power the Olympic Village I suppose plus pump the water up into storage for later release. So it is POSSIBLE, depending on the ratio of the total of the renewable solar energy generated plus the energy generated by the released reservoir water, to the energy required to pump the stored water, that the facility could still be (and probably will be) a net clean energy generator. If that's the case, what's wrong with a little showmanship to draw attention to the concepts? Some people just always seem to like to complain I suppose. I feel sorry for those types. I can't wait for all the rubbish talkers and those jealous of buildings larger than theirs eat crow. Sure this design might not turn out to be exactly as rendered, but I'd rather see imagination flourish in order to continue developing ideas until we reach something practical, sustainable and aesthetically beautiful rather than the naysayers shooting it down with nothing better to give us as a solution. It is world events such as the 2016 Olympic Games that provide a venue to show case cutting edge technology and architecture acheivements. The fact that this design is sustainable in it's own right is a tremendous endorsement of what is possible in the renewable energy age. If this was the industrial age we would be pumping water with non renewable energy imported for the occasion. @pbeseda "It looks great" doesn't excuse its shocking shortcomings, we really have too many beautiful-but-dumb designs already. what is this for? the energy is already there! in the water! It must be a joke. This is not an official project!!! It looks like self-marketing project of a nonsense architect with a lot of free time to waste. Please do that in Switzerland, because here in Rio we don\\\'t buy this kind of bad project. Gosh, you guys are harsh. I'd wait to see their energy analysis calculations before bashing them and calling their project rubbish and nonsense. I think it's a good looking design, and a decent response to the competition. You're right, it probably wouldn't be as energy positive as they hope, but without analyzing the solar plant, and the turbines we can't be sure. It looks great, and it's not hopeful, but I hope they prove us wrong. Awesome design.....but is it practical? I don't really think this is useful, after all all this is just a place for "social gatherings", shop and bungee jump?? I guess that program could be expanded to be much more interesting and useful. this is exactly the kind of nonsense architecture needs to move away from. the amount of energy required to draw the volume of water necessary for this would negate any net energy benefit. moving forward, the iconic, attention-grabbing masturbation excercise demonstrated here will hopefully be left behind with the trashy Dubai phalluses and refrigerated beaches. what a load of rubbish. the amount of water that could be stored at the top of that slab would in no way gush out as per the fancy render. they'd have to continuously pump water up to the top of that thing at massive quantities to achieve this 'waterfall' effect, otherwise its just going to be a little pissy mist coming out. so what we have is a massive vertical slab with a big pumping water system to push a whole lot of water out the top. what a ridiculous waste of energy. the token 'oh its to turn waterwheels' post-rationale for the 'awesome' waterfall image doesn't cut it. look at that amazing site! this... thing... is the best they could come up with? idiots. The self-sustaining tower for the 2016 Olympic Games is designed to create renewable energy for use in the Olympic Village as well as the city of Rio. A large solar power plant generates energy during the day. Any excess power not used during the day is utilized to pump seawater into a storage tank within the tower. At night, the water is released to power turbines, which will provide nighttime power for the city. On special occasions water is pumped out to create a waterfall over the edges of the building, which RAFAA says will be, "a symbol for the forces of nature." Info on the size of the solar and pumped water storage system is not available yet. Access to the eco tower is gained through an urban plaza and amphitheater 60 meters above sea level, which can be used for social gatherings.